Recent research into the share of wealth owned by the richest households has given us important insights into trends in inequality. This column shows how we can now estimate the share of wealth owned by the richest households in Europe, and how many they numbered, from 1300 to the present day. Throughout this time, the only significant declines in inequality were the result of the Black Death and the World Wars. Now we have comparable data for the preindustrial period. To a significant degree this is due to the ERC-funded project Economic Inequality across Italy and Europe, 1300-1800 (EINITE) (www.dondena.unibocconi.it/EINITE). EINITE has collected, systematically and with a uniform methodology, information about long-term trends in wealth inequality, and in the share of the richest, for many ancient Italian states as well as for a few other areas of Europe (Alfani 2015 and 2017, Alfani and Ryckbosch 2016, Alfani and Ammannati 2017). Whenever possible EINITE’s statistics cover the period from around 1300 to 1800, and so they allow us to extend the series of the share of wealth owned by the richest by about 500 years. 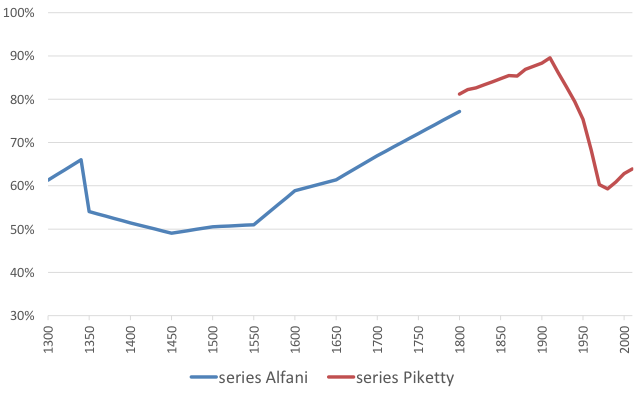 Figure 1 shows the share of wealth of the top 10% between 1300 and 2010, using Piketty (2014) for the post-1800 period. 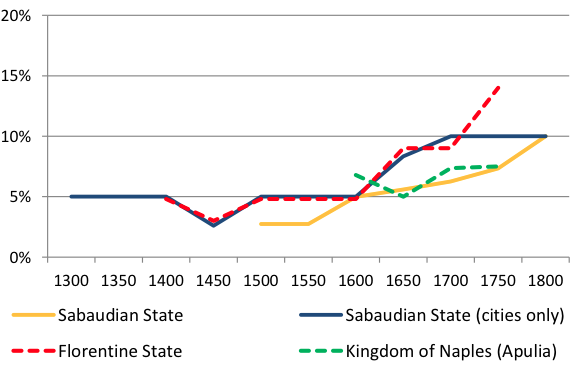 Notes: The Alfani series is an average of the Sabaudian State, the Florentine State and the Kingdom of Naples (Apulia). Before 1600, only information about the Florentine State and the Sabaudian State is available. The Piketty series is an average of France, the UK, and Sweden. Sources: Alfani (2017), Piketty (2014). The Black Death, the most terrible epidemic in human history, affected Europe in 1347-51. Afterwards the richest 10% lost their grip on between 15% and 20% of overall wealth. This was a long-lasting decline in inequality. The richest 10% recovered their pre-Black Death quota only in the second half of the 17th century). This decline in the share of the top rich, as well as in overall inequality, was probably the consequence of two main factors. On one side of the distribution there was an increase in real wages of skilled and unskilled workers. We have evidence for this in many areas of Europe, as described in Pamuk (2007). This helped a larger proportion of the population to gain access to property. On the other side, large patrimonies fragmented due to a mortality crisis which was occurring in the presence of an unmitigated partible inheritance system (Alfani 2010 and 2015). Shocks occurred between 1915 and 1945 related to the two World Wars, as argued by Piketty 2014, pp. 368-370). The share of wealth owned by the top rich has been growing again since around 1950, and reached 64% in 2010, but it is still far from the peak of 90% reached in 1910. The share of the richest 10% today is about the same as that in Europe (or at least, Italy) immediately before the Black Death. Alfani, G. (2017), “The rich in historical perspective. Evidence for preindustrial Europe (ca. 1300-1800)”, Cliometrica 11(3), forthcoming (early view: http://link.springer.com/article/10.1007/s11698-016-0151-8).